In this special blog we will provide you with a basic understanding about the game, how to manage your first settlement and how to fight some enemies. After you started the game you see a very similar screen. The knight in the shiny armor, you probably recognize him from the intro, is you. As handsome as ever. Next to your profile picture you see a mouse icon. If you click on the mouse, you can choose if you want to play with a friend in split-screen or alone. You can choose the input controller for your friend in the config-menu before you launch the game. You also see three bars having the color blue, green and red. These indicators are very important. 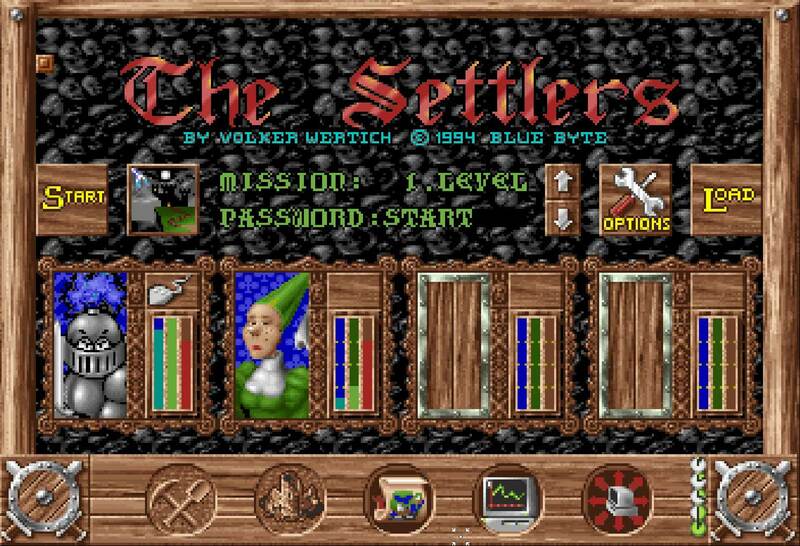 The blue bar indicates the stocks of a settlement at the beginning of the game. A large stock allows for rapid expansion and procures certain advantages. A small stock creates problems when the city begins to expand. The green bar indicates the intelligence level of the settlements controlled by the computer. This level affects the rapidity of their actions and reaction. The red bar represents the growth rate. The higher it is, the faster your settlements will reproduce and the faster you can expand. If you play the game for the first time we recommend to keep your own blue and red bar above 50%. It is now time to start a game. For the first game we suggest to play without any enemy or a very weak one. As soon as the game finished loading we see the game world and we can freely move around with the right mouse button. You can change the controls in the config menu – you can even switch to the legacy controls as it was 1993 / 1994. It is now time to find a good spot to build our castle and start our own settlement. You should look for a lake, trees, stone and some mountain ranges. If you see a mountain range you can use the geologist symbol to know what resources are hidden underneath it. With a left and right click (at the same time, or using the middle mouse button) on the “Pickaxe and Shovel” icon you display all of the possible building locations. After you found the perfect spot, it is time to build your castle. 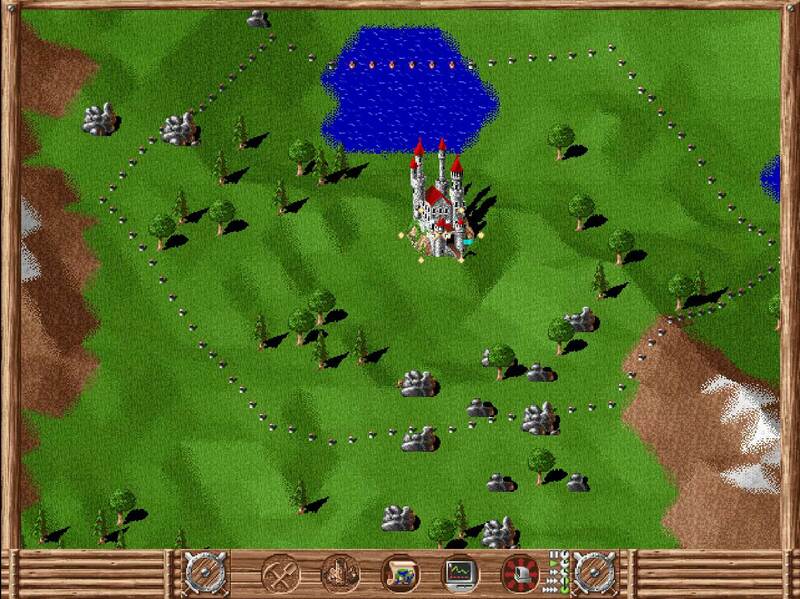 If you activated fast building mode in the game options, simply double click to place your castle. 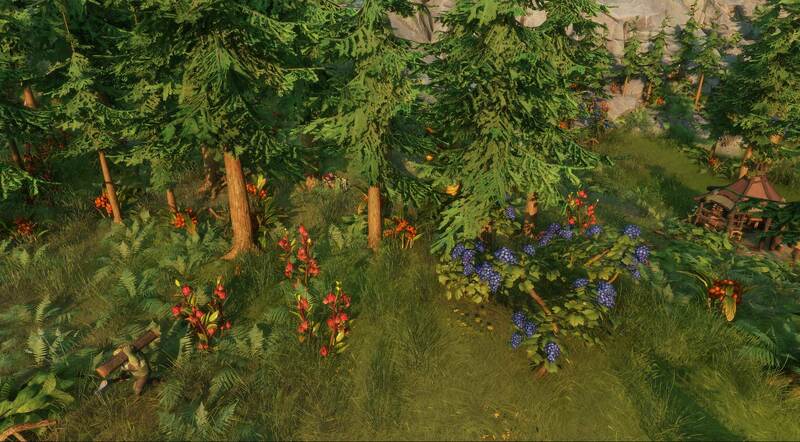 By placing a lumberjacks hut, a forest house, a sawmill and a quarry your basic supply of goods is covered. 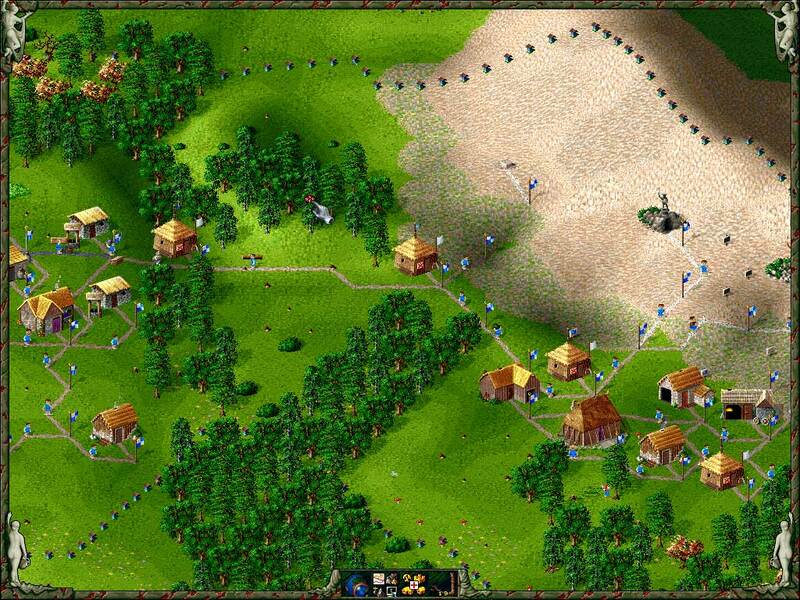 The settlers need roads so that they can access the different areas of their settlement. There is a flag in front of each one of your building. In the beginning, you must construct a road when you want to build your first house. You will see a flag in front of the construction, just like the flag in front of your castle. Click on one of the two flags and a symbol for the construction of roads will appear in the pointer and in the lower left of the menu. Connect the flags together and you see your small little helpers leaving the castle. The shorter the distance between two buildings the better. If you have longer paths, make sure to place flags where possible. This will divide a longer path into two sections and you have more carriers helping transporting the goods. A good road network ensures the rapid transfer of goods and, when there are problems with the transportation, allows you to more readily find other solutions. As you probably want to expand your settlement you should build guard huts in all 4 directions. This will ensure that you have enough space to build farms, industry to produce gold ingots and swords and shields to recruit soldiers. Let’s focus on military buildings and enemies. You already expanded your territory by placing guard huts. If there is no enemy around your flag next to the building stays white. When the enemy is closing in, a black stripe will appear and when the enemy approaches, the stripe changes to a black cross. In the last case you need to prepare for an attack. The flag does not only indicate the danger level, it will also tell you how many knights occupy the building. The higher the flag is raised, the more knights are in in the building. A hut can contain 3, a watch tower 6, and a castle 12 knights. In the military menu, as seen below, you can decide how many knights should occupy the building. Simply click on the plus and minus to change the setting. The second option lets you decide how many knights will stay in the building when you decide to attack the enemy. This will guarantee that enough knights stay behind to defend your territory. 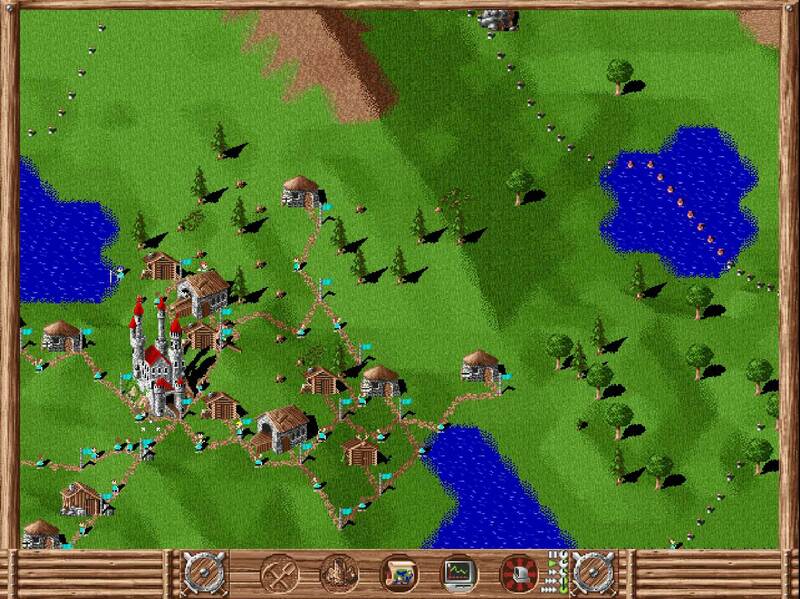 Of course there is more that we could tell you, but we want you to explore the world of The Settlers 1 History Edition on your own. Before we sign off, one important note. BE OBSERVANT: Look at your statistics from time to time, analyze your development mistakes or the negative results of an operation and try to find the best solution. A small change may have a profound effect. It is wiser to carefully plan your construction schedule and your strategy instead of building things haphazardly. You can find a game manual, in German, French and English in the installation folder of the game. 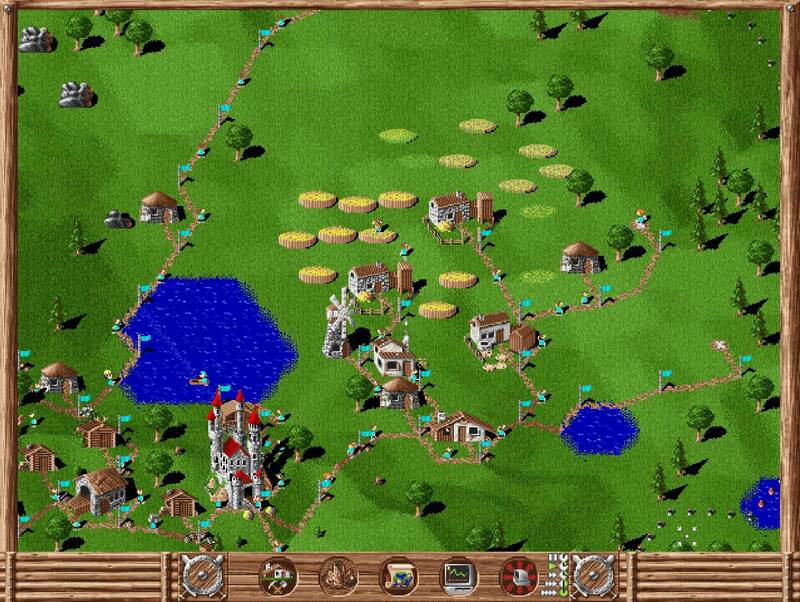 What do you think about The Settlers 1 History Edition? Have you played it? Do you have any open questions? Did you like the gameplay? Feel free to share your thoughts or any other tips in the comment section. Hello everyone and welcome to another community update! Since our last one some time has passed and we revealed a lot more awesome details about The Settlers. 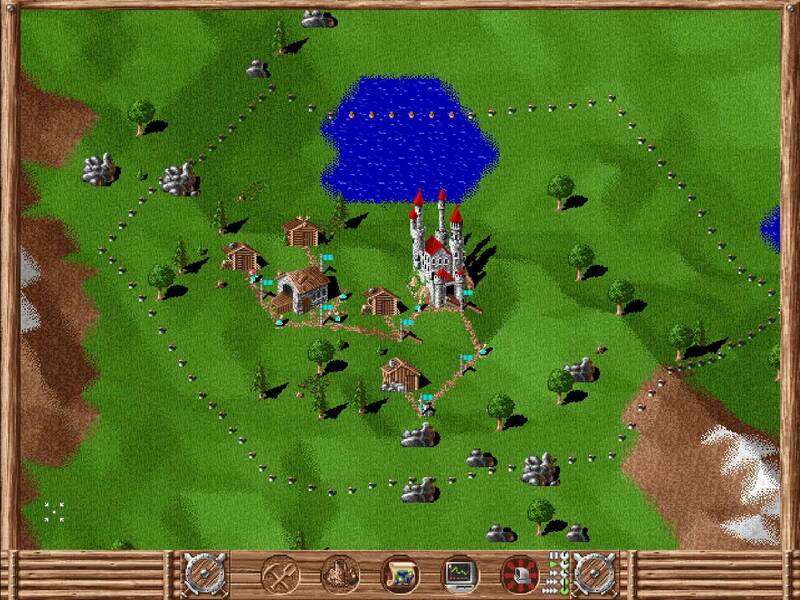 But the coming month will be all about the “The Settlers History Editions” – and some members of the community have already been actively creating nostalgic content. For everyone enjoying some The Settlers 3 multiplayer action, make sure to visit mrblues3 and suma3333 or watch the VODs on their channels. They’re both using the great community tool aLobby for finding opponents to play with, as you can see. For the History Edition we’ll bring back an easier way for multiplayer: You can easily start and find matches via Uplay and invite your friends. Aside from streamers, there are of course also several guys creating videos on YouTube. 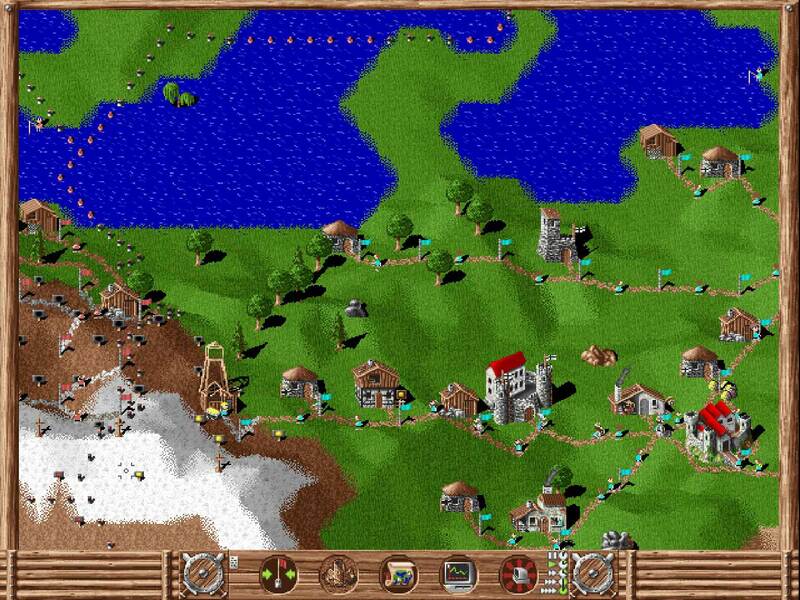 The focus here mainly is on the campaigns and less on multiplayer, so if you want to want to follow Zockerlounge’s Trojan adventures in The Settlers IV (in German) or Aliestor’s Roman conquests in The Settlers III, head on over to their channels. Maybe their videos will also provide you with valuable tips and tricks for your own playthrough. 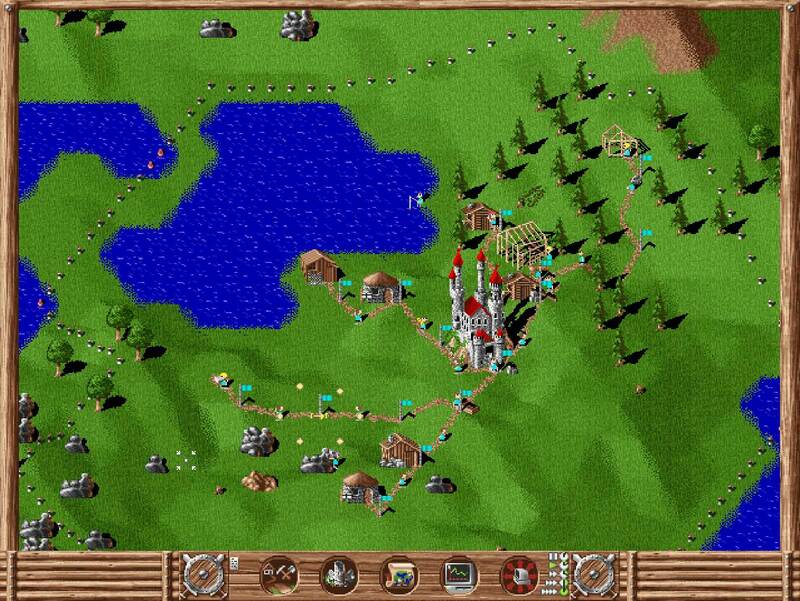 And on top of that, GouldFish On Games created a wonderfully nostalgic review of The Settlers I which you might want to have a look at. Several of our wonderful content creators are also active on the The Settlers fan Discord “Wuselworld”. So to share your own videos and screenshots or just to talk to fellow The Settlers fans, why not take a look? When the first part was released I must have been 12 or 13 years old. 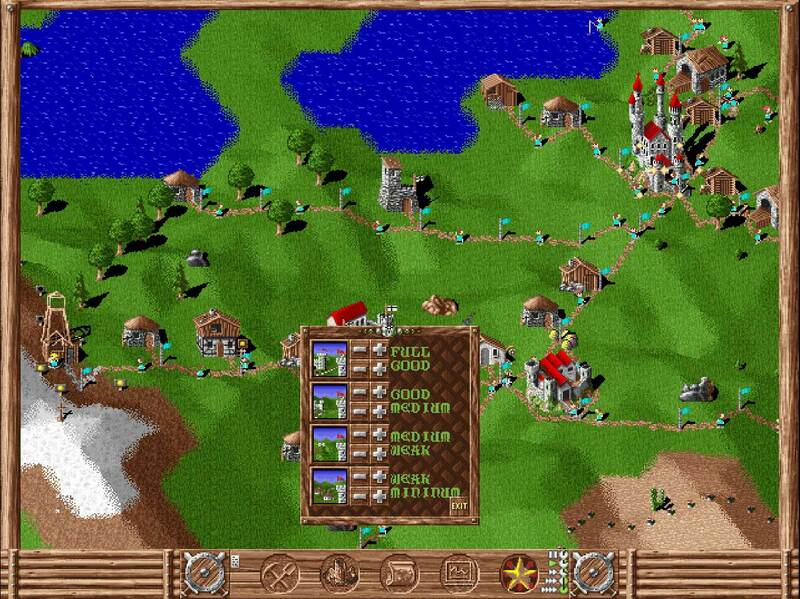 We didn’t gave a PC yet, back then so about 2 to 3 times a week I cycled 10 kilometers to my friend’s place just to watch him play The Settlers 1. The second game I played for ages but the thing I still remember today was a this strange situation with one of my mines. One my gold mines ran out of resources and usually you tear it down and move on. Don’t remember why but I forgot to tear it down. And after a while I again received the message that it was depleted. I was surprised about getting another message about the same mine and just watched it for a bit. A little bit later food was delivered and the settler really went down into the shaft and brought new gold with him. Even though the mine was said to be empty. After a few new gold deliveries I again received the “mine depleted” message. And well, I waited again until food was delivered and again he started bringing new gold to the surface. Unfortunately, this was my only mine with this strange function. All others worked normally and were indeed depleted at some point. Don’t know why this memory stuck with me for such a long time but it was pretty cool. As we said at the very beginning of this blog, November will focus on the History Editions, celebrating The Settler’s 25th birthday! That’s why we decided to not publish any new Dev-Blogs about the upcoming The Settlers but instead provide lots of content around part 1 to 7. Get ready for useful guides, several history streams by the community team and of course lots of nostalgia. The very first stream with Ubi-Barbalatu and Ubi-Thorlof will happen on the 31st of October. They will try their best to build a proper settlement in The Settlers 1 – more details to follow. In November we’ll then have several more streams which we’ll announce soon. Stay tuned for more info! 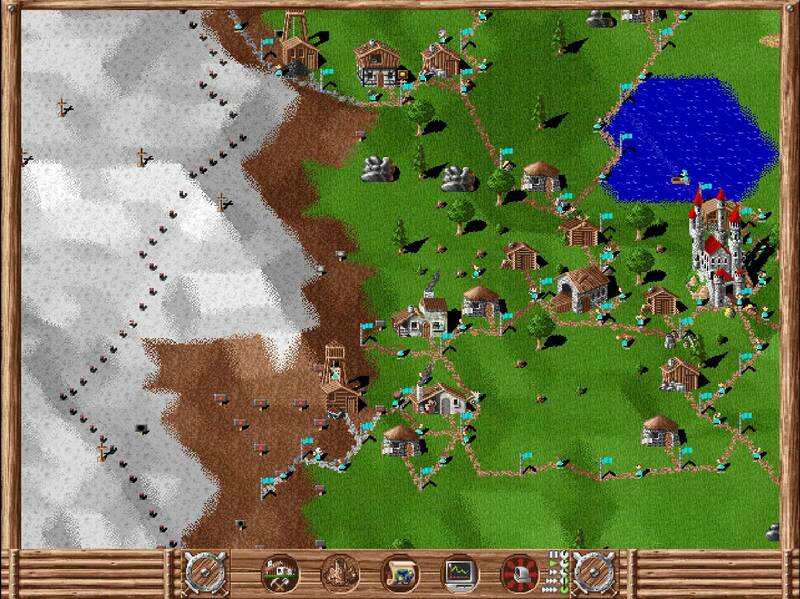 We’re always happy to hear about your The Settlers stories and anecdotes in the comments and discuss with you the pros and cons of roads, the differences between The Settlers 3 and 4 and why carriers are the unsung heroes of the series. And if you got an amazing community project you want to introduce to us, are working on magical The Settlers videos or creating cool, funny or simply stunning fan art then mail us at thesettlers-community@ubisoft.com and we’ll feature you in our next blog. If you follow our social channels you might have already learned about our new “Stamina and Food System”. If not, why not come and follow us on Facebook & Twitter for more info like that in the future. Even though we covered the basics we want to dive deeper into the matter and give as much details as possible. Where do we start? When we build a new settlement, we begin with the most basic buildings. With “What you see is what you get” we learned that we see everything in the world. We see multiple forests, berries, and if we pay close attention even fish near the coast. 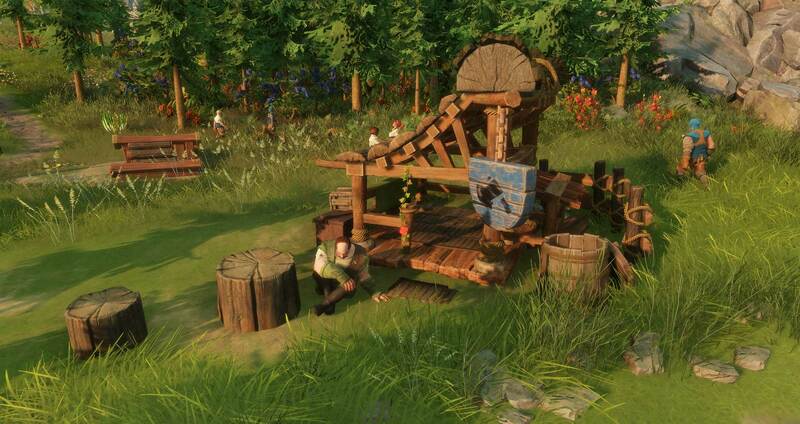 We started our outpost by building several woodcutter, gatherer and fisher huts. The last two buildings usually make up our basic food supply. This will only fulfill their own needs and our woodcutters will get hungry and stop working, because they need cooked meals. It is easily visible for us: The worker sits in front of the building, waiting for food. We need to place some houses. 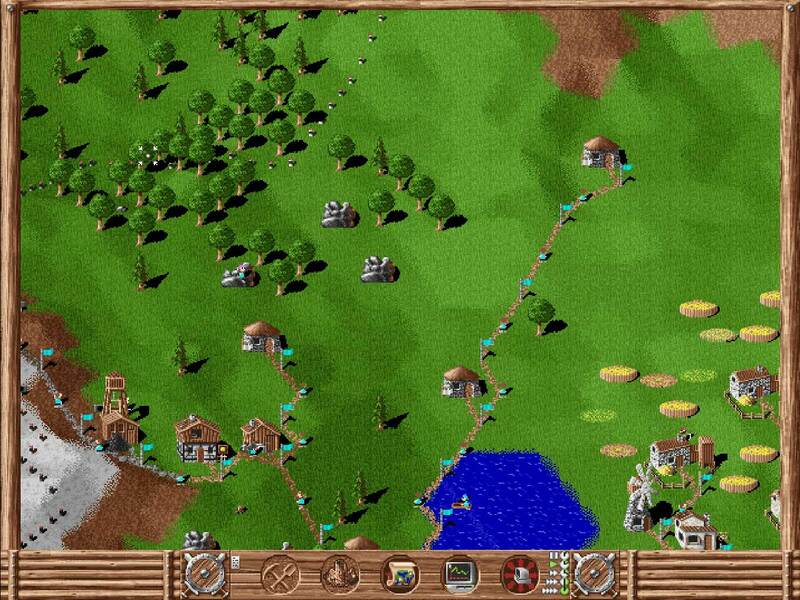 In the new The settlers the primary use of houses is to make sure to cook and deliver meals to ensure that all of our workers are fed and have full stamina. By building some houses, we have created a “small” food production chain. The fisher will catch delicious fish and the residents can pick up this fish from the fisher hut directly. The residents will go back to their houses and start cooking a tasty meal. The cooking process is under way if you see white smoke from the chimney. This whole process takes a bit of time, but once the cooking is done our residents will deliver the meal to different work places. If the worker has no stamina left, they wait in front of their building. Once the residents delivers the food, they will make their way to their own little designated eating place, consume the meal, regain stamina and go back to work. In case they are still out in the field working hard, they will find the hot meal when they are coming back. But what happens if the fisher and the gatherer get hungry themselves and do not receive any cooked meals at the moment? The fisher, the gatherer and also the hunter will eat their own collected or caught food (anyone up for sushi or carpaccio?) to ensure that they can keep working. However, since the food has not been turned into a tasty meal by a resident, it only deliver half the stamina. As we are always on the lookout to make our economy more efficient. It is time to talk about market stalls. Market stalls are places where specific food is stored and available for the residents to collect. 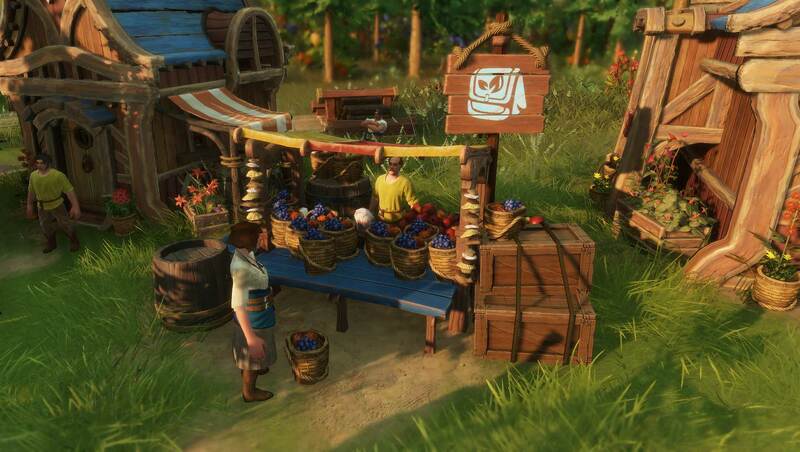 We will have different market stalls in the game. This will make it easier for us to plan and organize. It would not make any sense to have a fish market stall where no fish is around. Of course, we could still place it, but remember what we have learned in the transportation blog: The distance might be too long for our carriers and it could create traffic jams or bottlenecks. We placed a market stall for our fish and for our forest products, in this case berries. Our carriers will make sure that the goods from the fisher and gatherer are transported to those stalls. This makes the walking distances for our residents shorter and they can supply food faster for our hard working craftsmen. How does it look when we advance further in the game? The more we progress with our settlement the more buildings we unlock. We can also upgrade them and this includes houses. We will explain details about the upgrade system in a later blog post. The first step would be to provide more and different food to our workers. One classic production chain consists of wheat farm, windmill and bakery. We want to use those wide and nice grasslands to have an efficient bread production, by placing enough farms. Farms can also harvest corn and since our bread production works perfectly, we will need new market stalls, for bread and corn. We now can provide our residents with different food, but the real deal would be to provide them with better food. Upgrading the houses will make this possible. 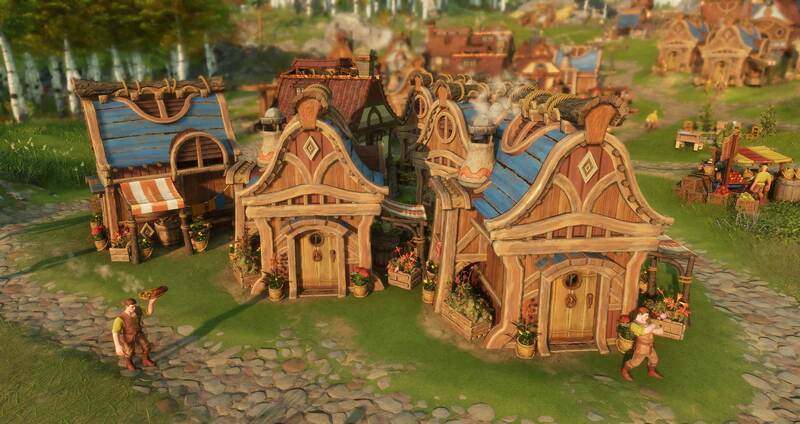 Better houses will unlock more advanced recipes to create delicious meals that deliver more stamina, which means the citizens will need to supply each craftsmen less often. As a result, the residents can supply meals to more craftsmen. Make sure to have houses close to major production chains as residents will not travel endlessly, to either get their ingredients or to deliver the meal to a work place. If you think that you need food only to provide your workers with meals and keep your stamina up, this is far from it. Food will have other usages too, but we will talk about it in another dev blog. That was our introduction to the new “Stamina and Food System”. What do you think? Do you like the change? 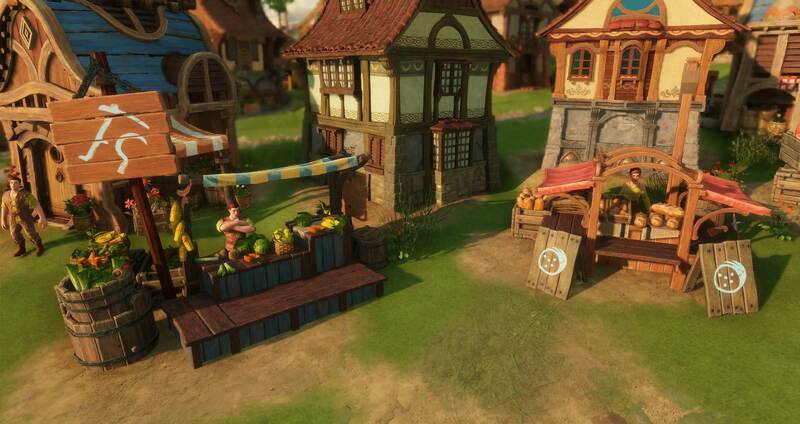 Can you already imagine a nice and bustling marketplace with houses around? Feel free to share your thoughts in the comments below. Last week we talked about WYSIWYG – What you see is what you get. We learned many different things. This most important thing however was that you see where every good is in the world. This of course means you will need to transport those goods to different locations. In early stages, carriers will transport the goods from one location to another, but they can only carry one good at the time. In the beginning, it is important to make sure that your economy is efficient. This means, that you place buildings, which belong together in close proximity. This will make it easier for your carriers to transport the goods from one place to another. As you only have a limited amount of carriers and you want to be sure they use their time efficiently, as this enables you to train carriers you don’t need to become soldiers or craftsmen. Below you see an early production chain. We found copper, placed a couple of copper mines around the deposit, the toolmaker and the guildhouse, to train new craftsman right next to it. This keeps the distance for the carrier very short. They only need to pick up the copper from the mine and transport it a few meters to the toolmaker. The toolmaker will use the copper to produce tools. Which will be picked up the finished product and bring it to the guild house where we can train new craftsmen. As you can see in the screenshots, the carriers find their way to all the production buildings without placing any roads. By simply watching them, you will know where they are going and you will find out their favorite route. If you now want to build roads, we offer three different types in our game. As we have not found any advanced materials yet, we can only build a broad path. 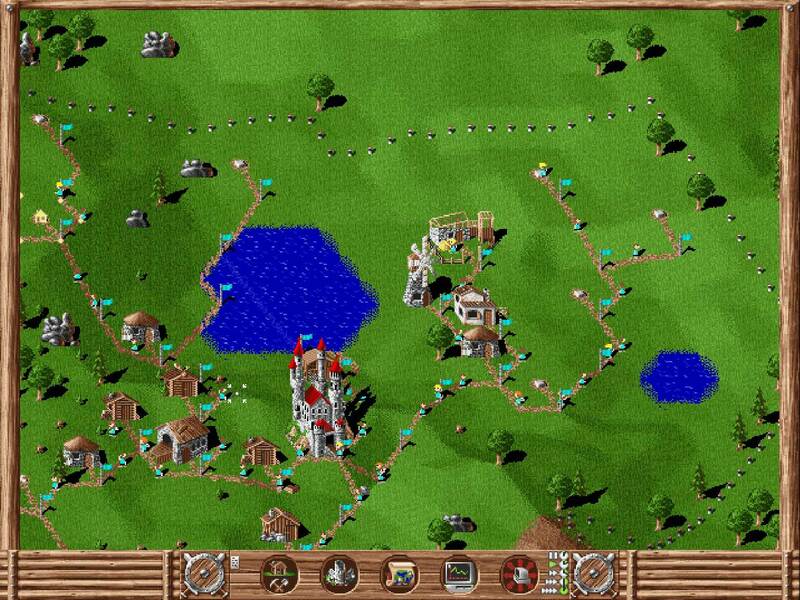 Roads have the advantage that our settlers will move faster. The better the road, the faster our settlers will carry their goods. Vehicles have the same speed as carriers, but they are able to carry multiple goods, which has two advantages: The first one is obvious, as you need less Settlers to transport your goods. The second advantage is an increased throughput, which means the amount of goods that can pass a location within a certain time is higher. This might be important if there is a bottleneck in your transportation route like a tight mountain pass, which limits the amount of goods you can get from one side to the other. There will be three different kind of carts: Pull carts, donkey carts and ox carts. The donkey carts require gravel roads but they will carry up to five goods at the same time and ox carts will require paved roads but can carry up to even eight goods. In order to construct those vehicles you will need a wainwright’s and a wheelmaker. Remember: The more carriers and vehicles you have on the road the higher the likelihood that you will have a traffic jam. Traffic jams happen if you need to move many goods from one location to another. If there is a bottleneck on the way, people might have difficulties moving along. This mountain path makes it difficult for our settlers to transport their goods or even to get to their destination. We could build some woodcutters to chop down the trees and build an alternatively road or we could try to upgrade the road to use ox-carts, or we could try to produce more of those missing goods on the other side of the mountain pass to avoid the need for that many transports. There are always ways to make your economy more efficient. In order to better organize your settlement you have the option to build different resting points. Resting points will help you to manage your economy more efficiently. Rather than having all your little helpers everywhere separated on the island, make sure that your main spots – the busiest places – have enough help when you need it. Resting points for your carriers will be a place where they meet and wait for a task in that area. Same goes for the donkey cart meeting point. They will have a place to idle and wait for the next goods to be transported. And this can happen anytime. E.g. Simply recruit multiple military units and goods will need to get moved fast. Iron ore & coal needs to be transported to the iron smelter. The finished iron needs to be moved to the weapon smith to produce weapons and those weapons need to find their way to the casern to recruit new units. If you have a resting point close by, your carriers have a short way to pick up those goods. Otherwise, they might come from far away and cause a delay or even add up to a traffic jam, which might already seal your fate. There is one more interesting topic about logistics. The location of buildings also matters since some buildings have 2 input and 1 output good or the other way round. E.g. a smelter gets coal + ore to produce iron. Depending on the location, the player can influence how long those goods need to be carried and use it to reduce traffic at bottlenecks, e.g. if you produce the iron on the side where you mine the coal and ore, only the final iron (half the transports ) needs to go through the bottleneck location. To sum it up in The Settlers you can build three different types of roads, use vehicles or set up resting points for your carriers. All three options will make your economy more efficient. Even though it seems like a small thing, once you combine everything, it will make a huge difference. Let us know what you think in the comments. Do you prefer building roads? Do you like planning things before hand? Maybe even pause the game, look around and then start placing buildings? Or do you prefer the freedom and a more “chaotic” playstyle? Let us know. We want to hear from you. After summarizing gamescom 2018 in Cologne and answering some of your most pressing questions, it is time to dive deeper. 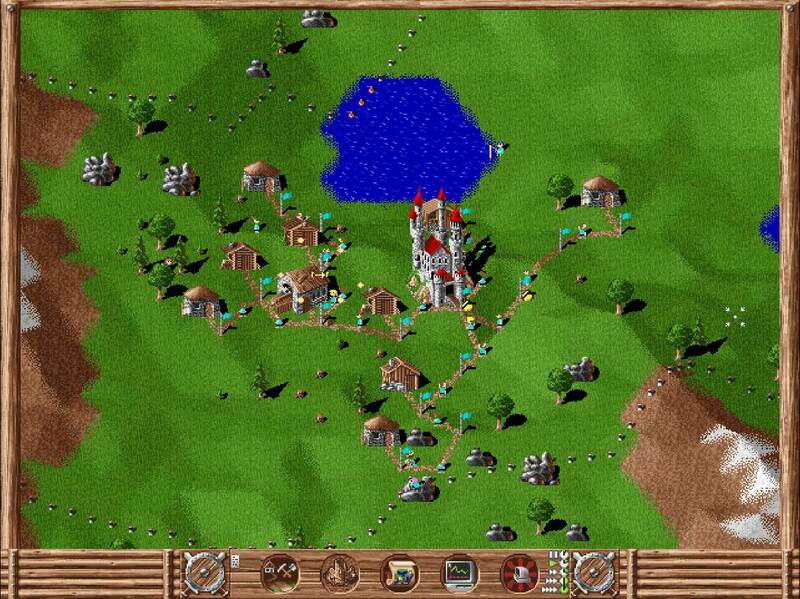 Let us jump into The Settlers universe, talk about various features or what makes a The Settlers game unique. The Settlers have a unique DNA, which defines our game and how it plays and feels. Today we want to talk about one of the key elements of this DNA, the “WYSIWYG”-approach and how this translates into our game. What does this actually means? WYSIWYG stands for “What you see is what you get”. Everything that happens in the game systems is visualized. Lets take a look at the life cycle of a tree. As a player, you see a tree grow and the tree is an object in the world. If you build a woodcutter to chop down this particular tree you can follow him. The woodcutter will go to the tree, cut it down and transport the log back to his building. The tree is gone and you have a log instead. This log will then be transported to a sawmill to produce wooden planks, or to other buildings as construction material. You can just watch and see what happens. With this knowledge, you as a player, are able to learn and to understand the game system directly. You technically do not need any statistics and graphics to visualize anything. You could zoom in and count the logs in front of a woodcutter building. You will know, if you just have one woodcutter and no one transporting any logs, how many logs your whole settlement has. Talking about wood all the time, does it work for other things as well? Yes. It works for everything in game. It does not matter if it is fish, grain, stone, swords or even your settlers. Every good or person is there where you currently see it, him or her. We sat down with Lead Game Designer Christian Hagedorn. He told us, he brings WYSIWYG to the next level, but sometimes it gets hard! Thank you very much Christian for your time and insights about “What you see is what you get”. As Christian already teased, next week we will talk about traffics jams, road systems and vehicles, but before we do that. We want to know what you think about WYSIWYG. Do you like the level of detail? Which statistics would you like to have about your economy? Let us know in the comments down below. © 2018 Ubisoft Entertainment. All Rights Reserved. Snowdrop, Ubisoft, and the Ubisoft logo are registered or unregistered trademarks of Ubisoft Entertainment in the US and/or other countries. The Settlers, Blue Byte, and the Blue Byte logo are registered or unregistered trademarks of Ubisoft GmbH in the US and/or other countries.